So I signed up for my first Flickr swap of 2015 - The Great Pillow Fight. Where as the name suggests we make pillows/cushions - whatever you like to call them. Anyhoo my partner has a liking for colour - lots of it in rainbow or jewel tones, nothing pastel or insipid here. I pulled out a few fabrics (lots actually and spread them all over my cutting table until I was happy with my choices) and arranged them into a colour wheel, wondering what I would make her. Inspiration struck in the form of the Fractal Quilt Block by Patty Sloniger. I have been wanting to make this for a while and now have the perfect excuse. I also remembered seeing the perfect fabric for the backing in Spotlight, so that came home with me too. So far I have completed five wedges and am liking how this is coming together. Fingers crossed my partner will too. a pile of new reads on my bedside table. I have just finished reading First Frost by Sarah Addison Allen. I enjoyed reading this book which was the sequel to her first book Garden Spells. a new recipe, which hopefully, only The Scout and I get to enjoy, (it really doesn't look like it is big enough to share with too many people) - Passionfruit Coconut Fudge Cake. Recipe from the March issue Australian Home Beautiful Magazine, although this recipe is similar. It is currently sitting in the fridge setting, so I haven't been able to sample it yet either. the basting has been done, and I have started quilting my Jacob's Ladder Quilt. It is going so much more smoothly than Mr J's shirt quilt did, so I am feeling rather happy with it. On Sunday, the Scout, Miss B, Mr J and I all had a hearty breakfast, packed our day hike bags, put on our hiking boots and headed west to Karekare Beach. This is a black sand beach, (made famous by the movie - The Piano) bordered by the rugged yet beautiful Waitekere Ranges. We were doing the Karekare -Zion Hill -Pararaha Valley-Tunnel Point Beach Track. This track is only about 7-8 km and took us just under 4 hours. The first part of the hike was Karekare to Zion Hill - uphill all the way in very warm sunny conditions. A short stop at a lookout gave us stunning views of the beach and the endless Tasman Sea. Needless to say we were extremely pleased when we got to the top and it levelled out. The next part part of the track was lovely native bush, lots of kauri, ponga ferns and nikau palms to shade us. After a brief lunch stop we started Pararaha Valley Track, walking on board walks through swamps and then very narrow tracks through tussock covered sand dunes. Then we hit the fine soft black sand. This was hard going, but again we found flat land at Tunnel point, where we went through an old abandoned tram tunnel. Once we left this part, it was a black sand beach walk all the way to the car park, with the ocean to our left and rocky cliffs on our right. It was a good hike, through lots of different and interesting terrains and landscapes. No doubt we will have a few stiff muscles tomorrow. The batting has been purchased for my Jacob's Ladder Quilt (love Spotlight's 40% off coupons), the backing has been pieced, and I can't be bothered putting it all together today. However I still wanted to sew something. I have been loving all the arrows and feathers people have been making from different mediums and posting to Flickr. So today I purchased a pattern for a paper pieced arrow from Quiet Play and started playing with fabric scraps and colour combinations. one finished arrow - measuring 3" x 12"
I am going to make a couple more, then I think these may get turned into a mini quilt for my sewing room wall. backing fabric for my Jacob's ladder quilt - Wildwood Forest Floor by Cloud 9, from Spotlight. It is not as finely woven as normal quilting cotton, but it is still organic cotton and is quite suitable for a quilt back. It is a fabric I have loved for a while and the coloiurs echo most of what is in my quilt. 30% off helps too. It was a long weekend, and lots of work got done in the garden, none of it photo worthy though. Yes, the jasmine got cut back, lots of compost was shovelled into my gardens and the lawns got mowed. However the big news was the I did get to do some sewing, and finally the top of my Jacob's Ladder Quilt is finished. It measures 64" square, and I am hoping I will get it basted in a couple of weeks when the rest of the family is away at a scout camp. 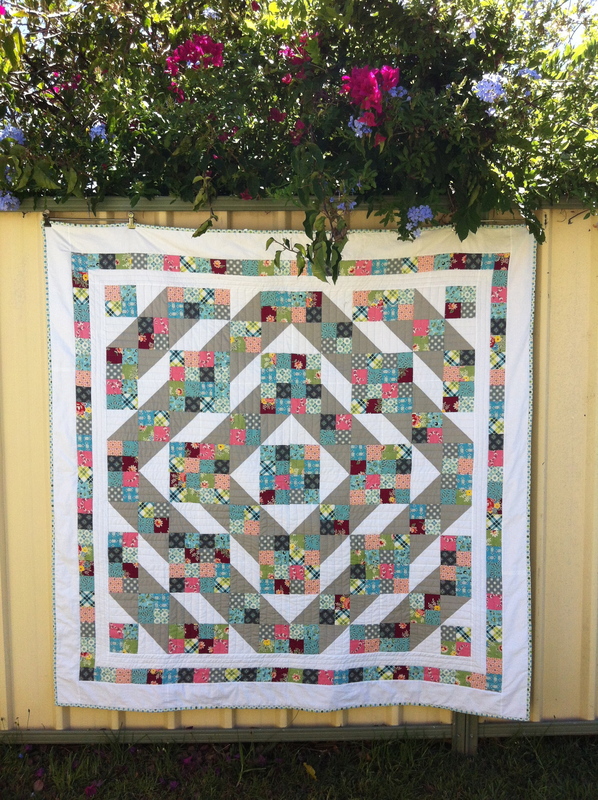 (Sorry about the slightly blurry photo - it was windy all weekend, not good for a floppy quilt top shot). Hope you all had a great weekend and have a fabulous week ahead. Early last year inspired by this beautiful quilt, I started piecing blocks for my Jacob's Ladder Quilt. After completing the 16 x 12" blocks, I put it away, Why, I don't know. I think perhaps I was to scared to assemble them properly, in case none of my seams or points met properly. Last week I pulled this project out again, I want to start some new projects, but have decided I need to finish some WIPs first. This weekend just gone, after hours spent kneeling on the floor (I really need as design wall), I finally settled on a layout that both The Scout and I liked. A couple of hours pinning, sewing and pressing over the last couple of days and voila, we have the beginnings of a quilt top. I have added the first part of the border with the charcoal strip. Now I just have to decide whether to do a scrappy border ( which means cutting another 100 or so 2.5" squares) like the quilt that inspired me, or do I cheat and take the lazy option using the pale foggy grey and a partial scrappy border, pictured above, before adding the last charcoal strip. Then maybe a scrappy binding using the Denyse Schmidt fabrics from her Florence range, Decisions, decisions decisions. finalising the layout for my Jacob's Ladder Quilt - I think this is the hardest part, making sure the colours are balanced and not too many of the same together in the scrappy blocks. the shirt quilt has been gifted to Mr J - his reaction was "yay my quilt, it's better than I thought it would be"